Inflammation of The Iris – What Are The Dangers of Iritis? 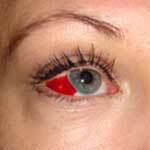 Chronic Iritis – Is This Condition Curable? Chronic iritis is a very stubborn and hard to treat condition that is described as inflammation of an iris or adjacent tissues, and is very often referred to as anterior uveitis. Surprisingly, most ophthalmological specialists are not trained to diagnose and treat chronic iritis of the eye condition since it requires a specialist. Most patients diagnosed with chronic iritis already have a predisposing autoimmune disorder in which immune system cells target the eye itself causing iritis symptoms as inflammation, redness, photophobia, blurred vision and characteristic spots in the field of vision. Underlying causes for anterior uveitis remain unknown and trying to find them in most cases is a guessing game. Anterior uveitis is extremely hard to diagnose since presenting symptoms very often mimic those of other eye conditions similar to bacterial or viral conjunctivitis. Iritis of the eye is considered a type of anterior uveitis and should be treated only by a specialist since most main stream ophthalmologists are simply not trained to address this complex condition. Iritis is the inflammatory condition affecting the iris of the eye. The iris is responsible for controlling the amount of light entering the eye by contracting the muscles around the pupil making it smaller. When the light conditions change, the muscles relax allowing the pupil to dilate, so we can see better in a low light settings. Iritis of the eye is considered a type of anterior uveitis or, in other words, inflammation of the middle part of the eye. In some cases the iritis of the eye is caused by a head or eye trauma, which subsequently causes iritis symptoms.